« A House filled with laughter up the Lomami. And what do they find? More of the same. Alas. Ashley, Bernard, Kahindo, Dino with all their field teams , headed south in both dugouts. The teams heading south to do inventory circuits in new areas. 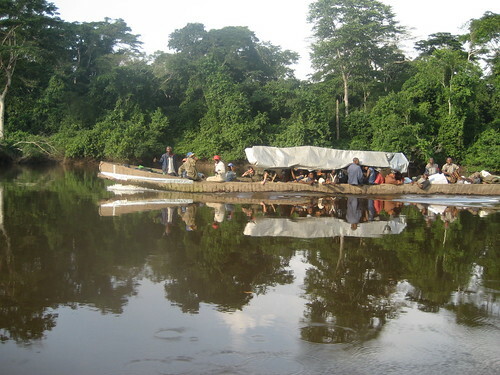 They stopped at the village of Ngoma Myuli, in the Province of Kasai Orientale and within the new Sankuru Reserve. It is a small village of just over 30 people. The ethnic group is Balanga. 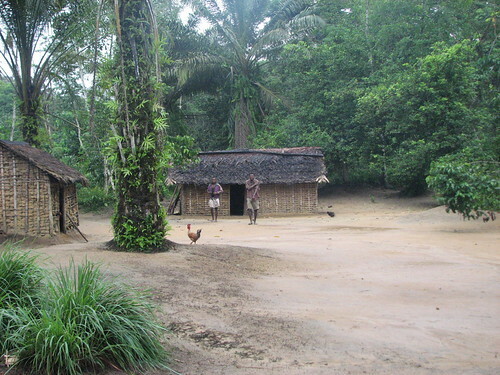 Ngoma Myuli is a small pleasant village. “They are friendly and open, but have no scruples about hunting. That’s how they make a living. They proudly showed us yesterday’s catch. It includes monkeys and among them a bonobo. 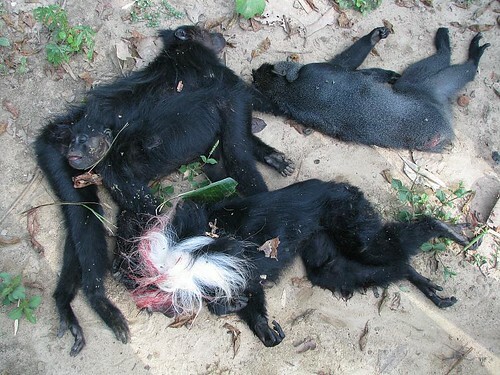 They caught two black mangabeys, a black and white colobus and a local variety of blue monkey. There is a 12 gauge shotgun. That is what killed all of them. There are no military weapons: No AK47, No FAL and no outlaws or brigands terrorizing the population. 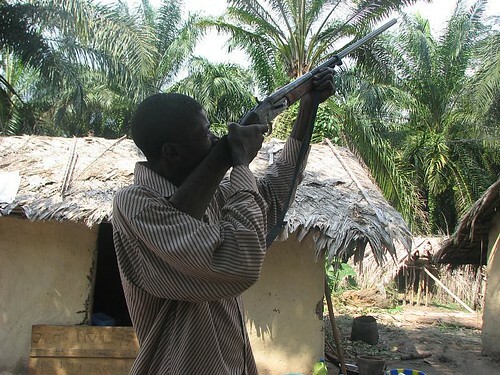 The headman demonstrated his old 12-gauge for me — that was all he needed to make a life from bushmeat. 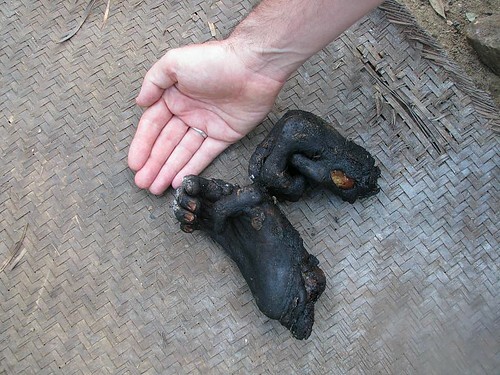 The bushmeat is carried to the village of Kindu. It takes at least 3 days to get there: pirogue and bicycle. Sold in Kindu, the dead monkeys are each worth 8000 Francs Congolais or $14.50 That is more than twice the mark up from selling them here to a traveling merchant . But the bonobo – now that is real money – if smoked whole and sold in Kindu, it could get 50 US dollars, maybe even a bit more. 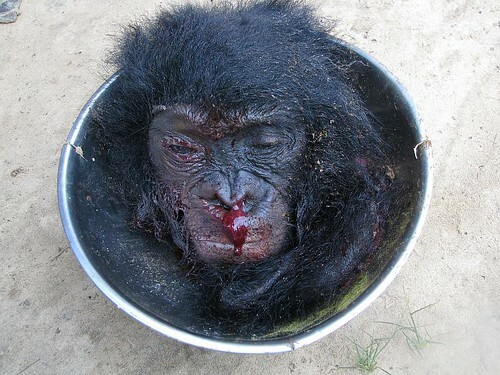 Head of male bonobo killed in same hunting trip as the primates pictured above. This is the challenge to conservation. How do you turn good people away from a good living with no alternative of equal value to offer ?? How can the hands of these two species be made more equal in our use of this land? Who Is Ashley Vosper and Where Is He Going? This entry was written by Terese Hart, posted on 2008-06-17 at 11:07 pm, filed under Bonobo, Bushmeat. Bookmark the permalink. Follow any comments here with the RSS feed for this post. Post a comment or leave a trackback: Trackback URL. I hate it – it angers me to no end — there is absolutely nothing that can excuse the fact that they kill wildlife that will soon be all gone — so I hope the deaths are short and swift and I hope there is no torture and I hope that when the forest are empty and the money is gone and the sicko’s who buy it and eat it are satisfied and the Government’s that let this get by – may they all starve – the beautiful animals will be dead and at peace at least – let the humans who shot them scrounge in the dirt forever! horrible, i agree with wanda. Utterly depressing news. Do they not consider what will happened when they’ve killed every non-human animal? question – what is the difference between the people drilling for oil in the arctic and the hunters shooting bonobo in the Congo? I was quite touched by your last entry and the compassion in the facts – thank for the education…. There has to be an alternative of greater value than bushmeat. That happens in two ways. The first we don’t want to let happen: The bushmeat runs out and things that were lower value become comparatively more profitable with no intervention on anyone’s part. The second, that we have to find, means finding alternative livelihood of greater profit: fish farming? ?, growing high-value produce?? working for an enterprise ?? None of these is impossible — but in DRCongo as it is now, none is obvious. We are not giving up though!! Well, they could do what we do: chop the whole forest down, pave it over, build some strip malls and box stores. The bonobos would all die of habitat loss, but at least, the villagers wouldn’t be directly responsible as if they had shot them. Or would they? Alot of the people commenting are saying that these people are stupid for being so short-sighted about the natural resources in their area. But the fact is, they probably live far more sustainably than our culture does. If they lived our lifestyle, we would need 5 more planet Earths. I’m not saying I approve or that it should go on, what I’m saying is let’s look in our backyard and our own practices before telling anyone else they’re stupid and shortsighted. I certainly agree that it is absolute devastating how these beautiful animals were killed. I also think it’s important that more people learn how incredibly intelligent and loving bonobos are and that it should be a priority to protect them. However, some of you need to put yourself in the shoes of the people who need this work in order to live themselves. I think that before you call them terrible and heartless, you should take a second to think about the fact that they may be supporting their families. It’s easy to call this selfish when you’re sitting comfortably at your computer, but if you were actually in the situation, you may very well find yourself making the same decision. It’s much harder to think about the big picture when you’re in an immediately difficult situation. I am not arguing with anything you’re saying; I totally agree that this is a huge issue that needs to be addressed. I just hope that we can do our best to help without making judgements about the moral character of people who we don’t know at all, because that’s just inconsiderate and disrespectful.